I bet you thought the sandwich chronicles were over, huh? No, I’ve just been busy. Admittedly, I took a short break from sandwiches for a few weeks and there were also a couple duds (I’m not recommending those here). But we’re back at it this week with Deli Zone, known for their famous Brooklyn heroes. I had never heard of it, despite seeing it next door to the Homebrew shop where I buy bottles for my vodka infusions on a regular basis. My friend, Daniel (@boinzy on Twitter), recommended it to me when he learned of my sandwich research. There are three locations in Boulder and several more around Colorado (Denver, Broomfield, Longmont). I went to the one on Valmont (next door to Hop To It Homebrew), tucked away in a generic strip mall. There is a handful of seating inside and two tables outside. It didn’t look busy when I walked in, but during the short time I perused the menu and placed my order a steady stream of people came in to pick up sandwiches or place their own orders. 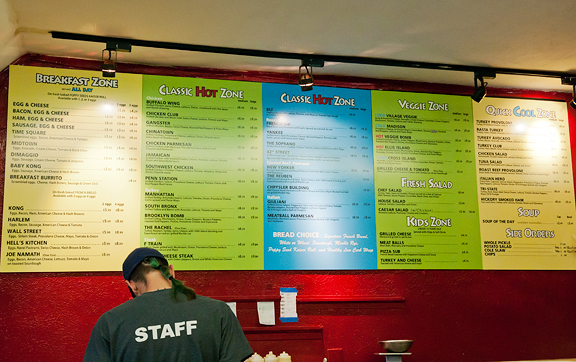 Deli Zone serves breakfast all day, which is good news for brekkie lovers. The rest of the menu is dedicated mostly to the sandwiches, which are broken down by their main filling. Sandwiches come in two generous sizes: medium is 8-inches and large is 14-inches. That’s alotta sandwich! You have a choice in bread from their signature French bread, white or wheat, sourdough, marble rye, poppy seed kaiser roll, or a low-carb wrap. There are vegetarian options too. I stood at the counter debating until I grabbed one of the employees and asked what their best sandwiches are. 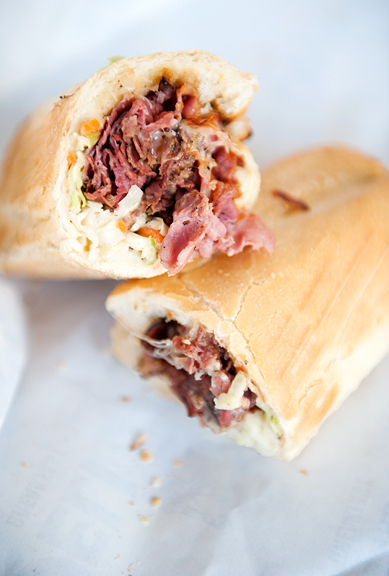 He squinted back at the board and thought for a second, The Reuben and the New Yorker were two of the most popular. I kinda had my heart set on 42nd Street or Yankee, but okay… I went for the New Yorker. To the sandwich: I honestly didn’t think there could be a sandwich to rival Snarf’s, but this is good sandwich. They are different sandwiches, but they are both excellent. The French bread is beautifully crusty on the outside and pillow soft on the inside. It is stuffed full of thinly sliced corned beef and pastrami with the coleslaw, dijonaisse, and Swiss cheese crammed in there for good measure. It’s the kind of sandwich that drips down your hand and wrist – juicy. And it’s hot which makes it extra delectable as you scarf it down. Fantastic! 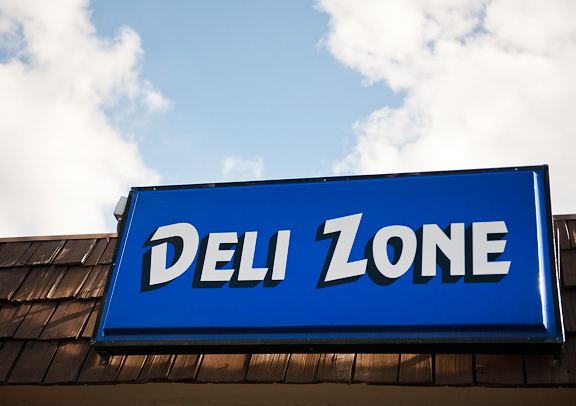 I highly recommend a Deli Zone sandwich. I gained five pounds just viewing this lovely item. I have passed this place without stopping a zillion times. Now I know where to go for my next Reuben! Thanks for the tip.